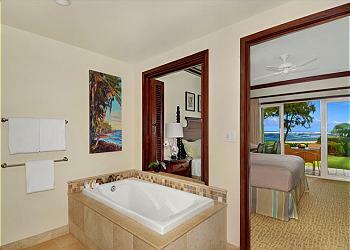 This beachfront, 2 bedroom and 3 bath suite is in a prized ground floor location of the resort. Just steps to the beach with prime ocean breezes, it’s also within close proximity to the pool and Oasis On The Beach Restaurant. 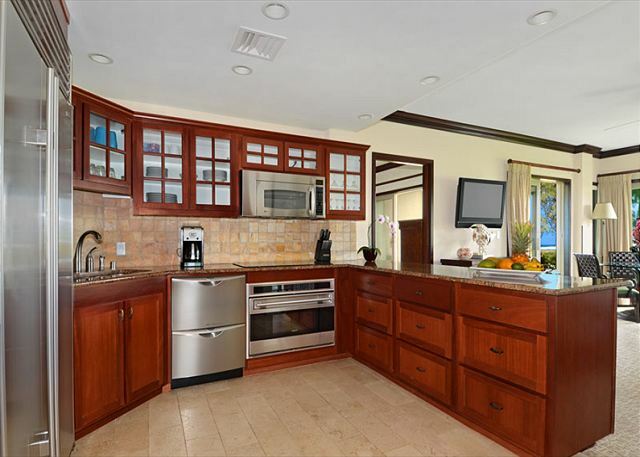 The stylish interior includes a stately kitchen with a Wolf glass cooktop & oven, Sub-Zero refrigerator, granite counter tops, African Mahogany cabinets, three full bathrooms with Peruvian Travertine stone surrounds and two soaking tubs. Enjoy the clean design and convenient location, with the beach and boundless Kauai adventures just outside your private lanai. Steps to the beach. Close to town. Reservation process was easy and convenient. Problem with the unit took a couple of days to fix. Great time, great location and pool. Will stay again! 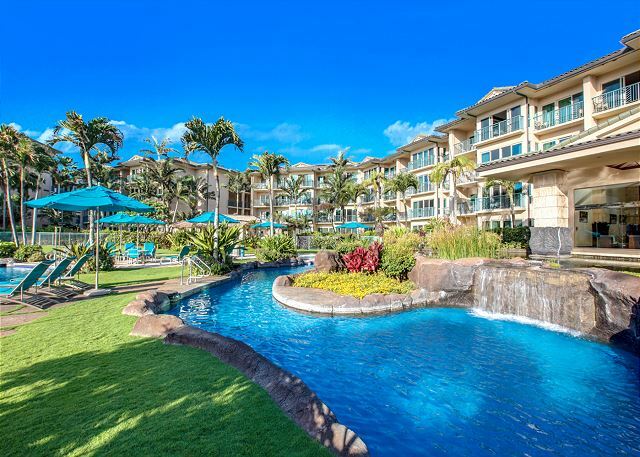 Paradise in Luxiourious Ocean Front Condo w/Great WiFi! 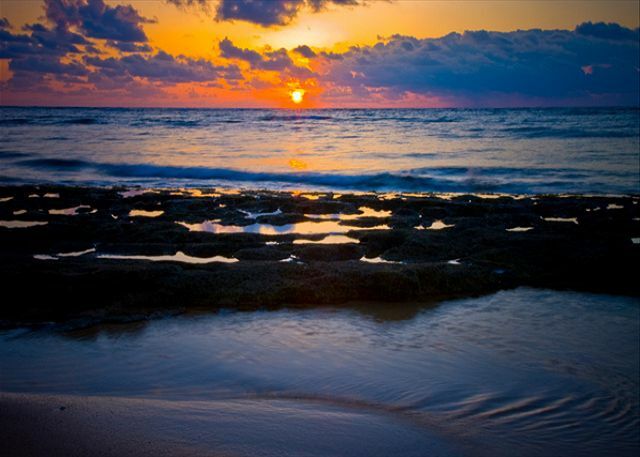 Before we even arrived in Hawaii I had several questions that were timely answered by Kauai Exclusive Management ... so I had high hopes for our vacation -- and was NOT disappointed!! 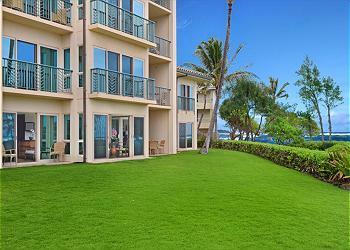 Condo A106 has the best location in the entire Waipouli Beach Resort! Off to the side (so all 3 of the lanais felt private) and yet we were close to the Oasis Bar and ocean. Both of the bedrooms were large and nicely furnished with BIG closets! Prior to arrival -- I had read some reviews complaining of the poor WiFi but had been assured that it would be fine in this unit ... and it was!!! I would highly recommend you book your next vacation with Kauai Exclusive Management ... I know I will!!! It exceeded all expectations. Every member of our family was impressed with our accommodations, from the beach-side location to the ample space in each of the four units. The comfortable beds were appreciated. The swimming pool was a favorite gathering place each afternoon as everyone returned from various activities around the island. The proximity of the Oasis was another convenient gathering place. Our family could not have picked a better place. Three generations of adults who had not been together for several years met half-way between our home countries. There was something for everyone to enjoy. Mahola! Wonderful location! Management responded quickly with all questions. Loved the unit. Amazing location. Gorgeous views. Unit looks better in person than in photos! Kids loved playing outside on the grass field and digging sandcastles. Plenty of room for everyone to sleep. We loved the kitchen and how the unit was well stocked with consumables. Thank you! We had a great time and would definitely stay here again. 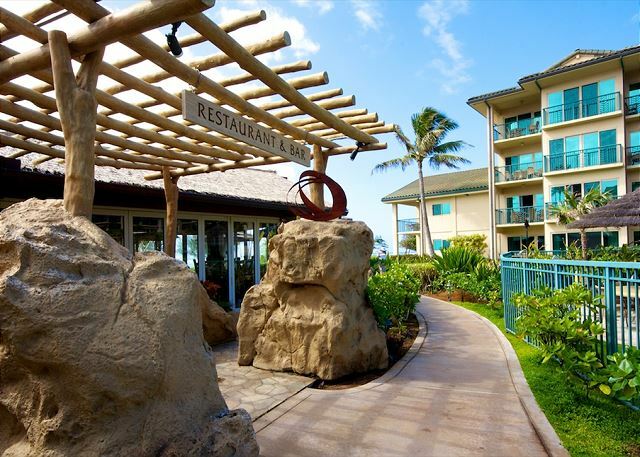 We have been going to the same place for years, love the Outrigger Waipouli and Kauai Exclusive has the best customer service. The units have gorgeous views, the pool is awesome. It’s our favourite place to vacation. The only thing we noticed was that this unit in particular could use a bit of sprucing up (paint, small maintenance items). Other than that, it was perfect as usual. This unit might have the best location in the entire resort - walk out your lanai a few steps to get to the beach. We had a great stay with 2 kids and 3 adults. We found the unit to not be quite as well stocked as another unit in this resort we stayed at before. Mostly little things like no cereal bowls or small spoons (weird). Also, the blinds could use replacement - they don't hold up too well in the moist salty air. But these are minor complaints. Overall we would definitively recommend this unit. 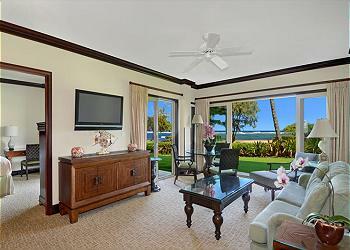 The location on the property is wonderful with ocean views from every room. The beds are comfortable enough and every room was clean. The restaurant was great the one time we ate at it. I only wish there were a way to lock the screen doors that were broken and/or more than the one pole was provided to allow for the doors to stay open at night and hear the sounds of the ocean. We would definitely stay there again. The biggest complaint that we had was with the resort itself who, despite several guests complaining multiple times, did not raise the temperature of the pool. I'm sure 70 is fine for a sunny day but since there were significant winds and clouds most of the days we were there it made it difficult to swim, even the kids were complaining. The cleaning crew comes at 9:30 am and I guess expects you to be out, even though check out is supposed to be 10:00. They stand outside your door until you leave which is not exactly how you want to depart. One never knows when booking online when the front door is open and we walk into our vacation spot. We were so pleased with the layout as well as they fully stocked kitchen. There is nothing that we could think of that wasn’t fair. We love being steps from the beach. They entire facility was beautifully wrong. Thank you for helping us to have a wonderful time! Everything was great! The room was clean and had all the supplies we needed. It was better than described and our entire stay was absolutely incredible. HIGHLY recommended! Very convenient stay for Kauai. Great shore view and pool for swimming. Great rooms with peace and quiet. Our only complaint was we are told we would be called when place was ready and we weren't. Beautiful location and walking out onto grass is a great perk. I've stayed in 4 locations around this property over the years and this would be my preference. Beach access is simple and you can't beat the view from this building. Wonderful, could not have been better. Unit A-106 is in a perfect location. Nothing but a shrub and sand between you and the ocean. We liked the ground level unit because the yard and beach are extensions of the patio. (the upper level units have small lanis). The management company is top notch; very responsive to all your needs. The restaurant and bar at the resort is fantastic; great food and and a great happy hour. Check out the local musician who plays on Wednesdays; a great young talent. The Waipouli condo complex is starting to show its age; as is the unit. For the rate the owners demand, it's time to fix the water damage in the bathrooms and complete the interior paint job. A week's worth of shampoo and soap would be nice too. But overall, we had a great stay and this is a great rental unit. A little attention to detail and this would get a 5* review. We enjoyed the condo and resort. It was a good setup for 2 couples. It was well maintained but you could see things are getting well used. The beds were a little softer than we liked. The beach was nice but a little cold so we preferred the pool and enjoyed the lazy river. From beginning to end, Kauai Exclusive is consistently top notch. We have rented our vacation spot from them for many years and are always very satisfied. They go above and beyond to make sure your trip is perfect. The reservation process is easy, their units provide lots of special items like beach gear and spices for the kitchen, and they are always available for anything you may need. Our daughter left behind a suitcase full of expensive toiletries and makeup, bringing her to tears. Kauai Exclusive's cleaning team found the bag, turned it in and it was shipped to us! I will never forget this!! We stayed in two condos on the first floor A building for five days. The accommodations were perfect. The condos are very nice with full kitchen, multiple bathrooms, and beautiful views. Wonderful place, great for families. Everything was perfect. The only issue that we had was the AC was not working when we arrived but was quickly repaired once we reported. Master shower needs a little TLC but not a huge issue. A106 was awesome. The rooms were clean and very well equipped. Some of our wedding party stayed with us in the second bedroom, and we never heard each other. Real solid feel. Kitchen is huge. Obviously a miss marked review! They loved the property and did not hit the proper 5 star rating.. OOPS! This property was absolutely beautiful, great location, close to the ocean, shopping, and restaurants and lots of activities! Everything was perfect, great location very close to the pool and the beach the condo was in great shape and perfect. We had four adults and one child and had plenty of space. We would highly recommend this unit. Best location on the Island, quiet, nice amenities, what's not to like. I would recommend it to anyone wanting the perfect getaway. I rented two codos right next to each other. We had a great vacation, and we got to spend some wonderful time with our grandchildren. This place was amazing! The location of this unit to the beach, pool, and the pool restaurant was perfect. I have absolutely nothing terrible to say about this place except that I found the shower in the queen bathroom to be less than satisfying. After a long day at the pool or beach you want a nice strong shower to wash everything off in. This shower head barely washed the soap out of my hair. I would suggest a change here, but other than that this place was incredible!!! 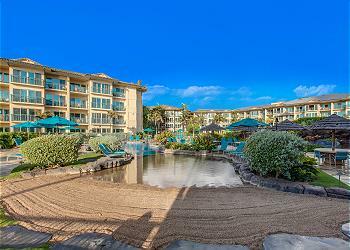 Right on the beach and very nice high-quality condo. Convenient location, if you like shopping, or the beach! King bed should be replaced soon. Our experience was great place is beautiful although there needs to be some lights installed at the barbecue pits one grilled did not work . The condo was great although they need a knife sharpener, bottle opener, and some more tongs and also the ice drawer was broken and needs to be fixed . Our microwave broke and they brought another one the very next day very good service very happy with the condo great view right on the beach. 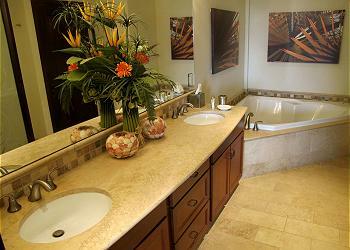 From check-in to check-out, a wonderful vacation rental experience. We will definitely be back! We stayed here with one other family last week. It was a beautiful room and the location was amazing. Another family friend stayed in the unit next door and our kids could play in the grass between our two units. We loved the location of the resort itself too. It was walking distance to Foodland and Safeway, but also downtown Kapaa with lots of shopping, coffee, shaved ice, and restaurants. 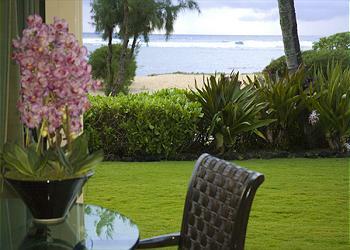 We have found Waipouli Beach Resort to be "the" place to stay when we go to Kauai. 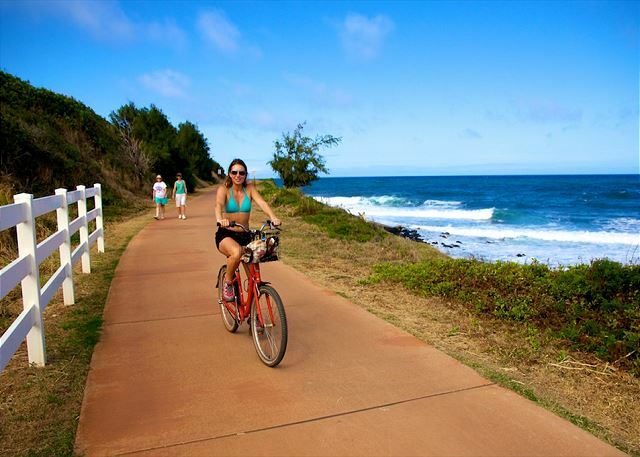 Being midway between the northern and southern points on the east coast of Kauai, it's excellent location makes it an ideal spot for launching your excursions. 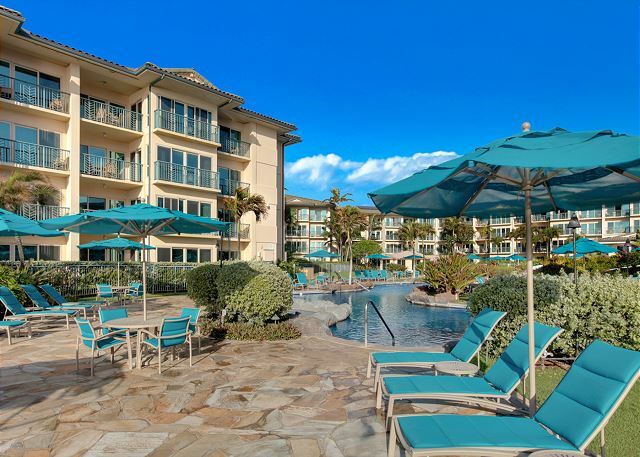 It's also a wonderful destination location with excellent, well maintained units, a beautiful pool facility, an outstanding gym, a fantastic onsite restaurant, and a nearly private beach to enjoy. 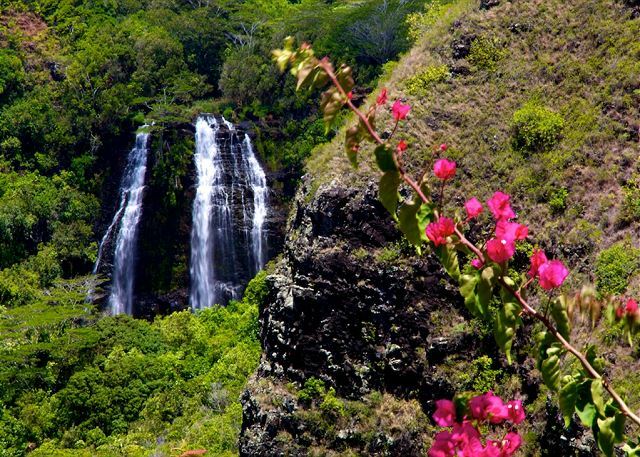 It would be difficult to find a more beautiful and relaxing facility on the island of Kauai. Highly recommended. We have stayed at this same place two years earlier. We choose it for the privacy and close location to the beach. Great place, will stay there again. We only stayed in this condo for one night since our first condo (Kauai cliff house) was already booked for the last day of our vacation. 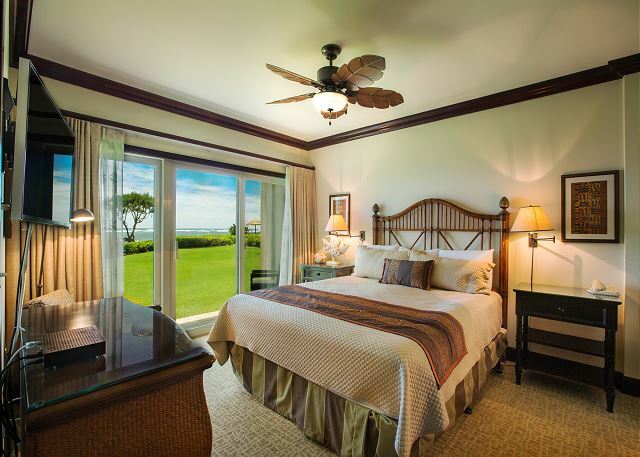 The Kauai Exclusive Team was very helpful in finding us a good alternative for our last day and was helping to arrange for a late check out so we could fully enjoy a relaxed day before late night departure. 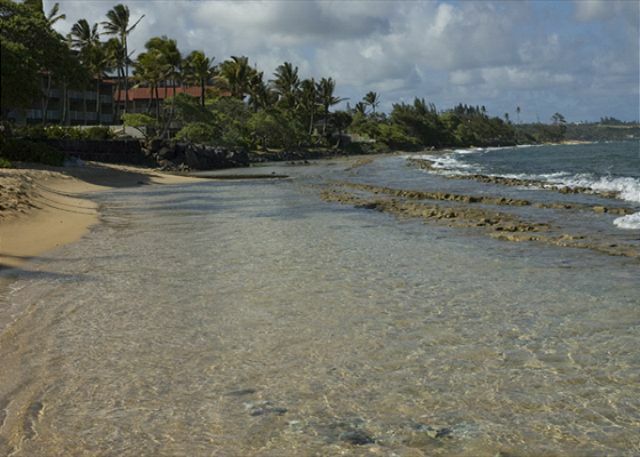 The location of the waipouli beach resort is just great- the ocean directly in your backyard and a lot of restaurants and shops in walking distance. South shore and north shore both in convenient driving distance. The unit itself is very spacious, clean, comfortable and nicely equipped and furnished- but the best for sure is to just have the ocean within a few steps of your patio. Lounge chairs are on the beach for use. Wish we could have stayed longer- the condo combines everything you can't get in a hotel for this price (lotsa space, ocean in your backyard, amenities of the beach resort..). Don't hesitate to book it if you can. Just spent 10 days in this condo with my husband and another couple. The condo is very well furnished and comfortable. The location of the resort is central on the island, which makes it easy to get to the north, south and west sides in short travel time. The management company as well as the concierge service were very helpful. Although we booked our own adventures directly, the concierge service would be helpful to those who are visiting for the first time. I readily suggest this condo and resort to others. Rental was amazing, everything we needed plus some. The view and beach access exceeded our expectations. We will definitely be back as soon as we are able. Our stay included a week of time in your A107 Unit. It was very nice and spacious. Beautiful views. Privacy was great. Our special concierge for our room specifically gave us all we needed all the time to enjoy our stay. We could not get the dishwasher to work but maintenance came and fixed it. The TV was difficult but we figured it out. The system to get into the pool area was difficult and everyone has trouble with the code but we figured that out too. Thank you for our nice stay in your beautiful condo. We spent a week here with our two kids, ages 2 and 7. This unit is perfect with sliding doors from the bedrooms and living room that open right out onto the lawn for the kids to run around and play. Though a bottom floor unit there is very little noise from the upper unit, I think just twice we heard someone moving a chair around, no footsteps or anything like that. The King bedroom shares a wall with the next units living room so sometimes we could hear their tv/music through the wall. Kauai Exclusive Management was very responsive to all requests and had impressive response times in getting back to us, often just a matter of minutes to email us back. Waipouli is great for people of all ages but great for little kids with a pool, water slide, warm hot tub for kids and a kids "beach" with pebbles in the pool area. We'll definitely be returning and would definitely recommend this unit. The unit had a few beach chairs and a snorkle mask and fins. This is our third time staying at this resort - 2nd in this unit and we LOVE this place. We have two small kids so having the groundfloor access to the lawn/beach is amazing. Love the location close to the pool as well. Brought our baby monitor and it reached to the hot tub and the restaurant;). We will definitely be back! Unit was exquisite. Very clean, well maintained and stocked. Resort was beautiful as well. Gorgeous unit with view to match! 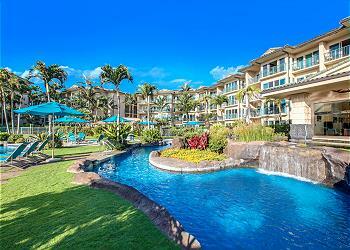 Kapaa location is incredibly convenient, but you feel away from the hustle of the city in this unit. Everything was very clean and fresh feeling - kitchen was fully stocked with everything we might need. Beautiful and comfortable furnishings. 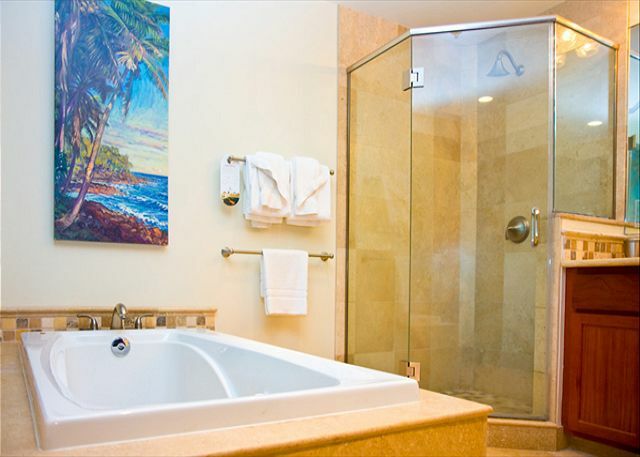 Gorgeous ocean views, easy beach access, and so convenient to visit the resort's many pool/hot tub options. The only downside was our Sprint phone service went to zero coverage in the room - but had full service in the parking lot... it was a little frustrating to always have to leave the room to send or receive calls and texts. Unfortunately we were only able to stay for three nights, but we hope to return again for a longer stay in the future. Location was awesome. Right on a perfect lawn for the kids to play on. Condo was plenty big for my family of 4. Beds were super comfortable. Pool was very nice. My kids loved the slides. We had a really enjoyable week in Unit A106. The unit was wonderful and had everything we needed. The beds were very comfortable and having laundry in the room was very convenient. We especially loved the view of the ocean out our window and the ability to walk right out of our unit and sit on the beach. Location was perfect for going north to Hanalei or south to Poipu. This was the perfect place for our large family. In the evenings we gathered out of the grass. A TRIP TO REMEMBER FOR LIFE! This is our first trip to Kauai and we were not disappointed at all! The complex was excellent and the condo was so nice and relaxing. We celebrated my mother's 87th birthday and as a surprise - I was proposed to (I said YES) so this trip was wonderful! We highly recommend this condo and our concierge, Sonja - she was fabulous. All our outtings were on point and this trip was the most relaxed we have ever felt in all the trips to aloha. THANK YOU!!!! Was great I will come back . We had two couple in our group, (4 adults.) 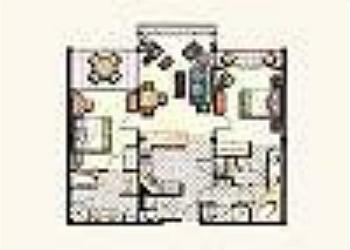 This was the perfect condo for us as we could each do our own thing or just as easily do group activities. It was very nice to have the option to cook our own meals and having a place to do that was fabulous. 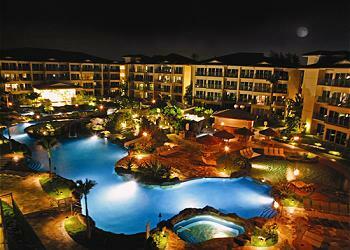 The pool, beach and facilities were top of the line and well kept. If you are looking for a good wake boarding, snorkeling or swimming beach, you will need to drive to another beach for that. But this one is great for spending a day laying out and having a few beverages while you relax and read. Oasis is a wonderful restaurant that was very, very convenient. All and all, this was a fab vacation and I would go back in a heart beat! All expectations met! Beautful condo, immaculate resort, and the view out the front windows/patio doors was amazing! Already planning our return trip! Would highly recommend this to anyone but especially those traveling with kids. Having an en-suite Kitchen and two bedrooms made it easy to travel with little ones. The pool is amazing - I'd be fine just staying there the whole stay! The room itself was great as well as it was easy access to the front lawn and steps away from the beach. You won't be disappointed! We had a wonderful stay in unit. 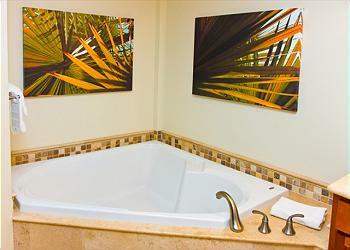 The size was perfect for 2 couples, the beds and pillows very comfortable. All appliances were high end and in perfect working order. The view is fantastic and you are so close to beach and walking path. My only criticism would not have anything to do with the unit: The pool was very cold to us although we loved the sand bottom spas. We are from the NW and used to cold water. The pool felt more like what we swim in here. But we still went in. All in all, great unit and great vacation. Excellent service from Sonja, can't thank her enough!! The location was awesome and the unit was clean and comfortable. Our concierge Sonja was super helpful with island activities and overall a great person to deal with. Thanks so much and we will be returning again next year!!! I can't imagine having a better location on the property! 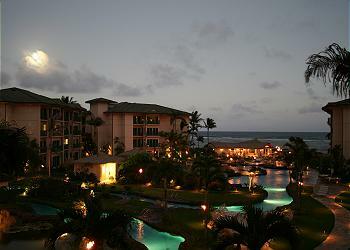 I will stay here again next time in Kauai. You will have a tough time getting closer to the water. We have looked at these units a107 and a106 for several years on previous trips, then this year booked both together. We could easily visit and walk between units with our friends. A house is nice, but this has all the amenities of a house, but way more, one of the best pools on the island, great gym, food, and handy shopping so close. Units are still very new feeling, great for families. location of a106 was excellent, great oceanview. Quality of beds also great. Only complaint would be sofa bed was terrible, no one could sleep on that so condo would probably only sleep 4 people. Otherwise great place to stay! Couch is being addressed now! 2 b/r, 3 bath, top-of-the-line kitchen, ocean front, steps to the beach, ground floor unit! Unit itself was perfect except for the couch (apparently, I'm not the first to report this, but it is stained badly on both sides of cushion and needs to be replaced), stain on one of the dining chairs cushion, one of the faucets in master bath doesn't work --- all-in-all, a great stay, would stay again as long as they change the couch next time. The resort is great, too, 4stars, because they don't have poolside service. Slides are sufficient, and pool area's fun. Grill worked well. Spa was very nice. Parking was no problem. Best value, IMHO. Call Josh for the best rates! Thanks, Kauai Exclusive! Fixing the couch now.. Parts for the faucet are on the way! The location was absolutely awesome. We could look out our window and see the waves. We were even lucky enough to have a seal come up to the beach while we were there. The room was lovely. With Rosalina Ice Cream being so delicious, it was hard to imagine the condo not having an ice cream scoup! 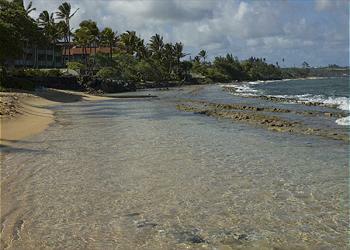 We got a great deal on an upscale condo, with a beautiful beach just steps from our patio. The vacation rental company had great customer service. They provided a high chair, playpen, and stroller for our toddler. Everything was set up in the condo when we arrived. The condo had everything we needed for a week's stay, even toiletries, laundry detergent, and dish washing detergent. The views from all the rooms were gorgeous. We spent a lot of time in the condo with the doors open just listening to the ocean waves. It was the most relaxing vacation I have ever had, and that was largely because of the accommodations. I would definitely recommend this condo and the rental agency. We enjoyed our stay. The resort is amazing. Unit A 106 is in need if a few repairs - Most of the window screens are ripped, one of the sinks in the master bedroom has a non-working faucet. My call to have it repaired was ignored (no follow-through). The shower in the 2nd bedroom leaked. The kitchen is beautiful. But, the living room soda needs to be replaced. All has been fixed.. Ground floor suites have the most walked through screens and we always hope to discover this before a guest does. Our cleaners have been notified to keep a closer eye on this! Resolved.. We have a no stain policy and this one got missed.. Had they called during the stay it would have been resolved in the moment. Mahalo KEM management..
We just loved the Waipouli Beach Resort and in particular this unit A106! With a small child, the location on the ground floor is perfect with the large lawn right out the backdoor with a beachfront view- absolutely amazing! We will definitely stay here again next year!! We enjoyed this so much what a great place to stay, from the beautiful condo to the beautiful location the ocean is right there sooo close. We brought my daughter who is 2 and she loved it. Josh was the best help we have ever had we will be back soon I hope ! Top-notch ground floor unit as close to the water as you can get. Can't wait for another visit. I am very glad that I used VRBO to find our honeymoon location. I must admit that I was very nervous about the legitamacy of the rental in the beginning, but after speaking directly to Joshua he alieviated some of those worries. Room 106A has one of the best locations on the resort. Ocean View. Steps away from the pool, the sand, and even the beachside bar. Everything was very clean and state of the art inside of the room. I must agree with a couple of the others... although the rain shower heads are a nice romantic touch, they are no good for getting an effective shower. The resort itself is also gorgeous. We wish we would have had more time to hang out poolside... to much to see and do in kauai (-: We did get to enjoy a couple "happy hours" with the bar staff. Joel was especially insistant on finding me a cocktail to love. Thank you to Joel and cute little blond headed girl with glasses (i wish i could remember her name)for entertaining and informing us on island opportunity. We hope that one day we have the opportunity to return to Kauai and would definitely stay at Waipouli Beach Resort again. My husband and I and our friends and travel companions thoroughly enjoyed our stay. The two-bedroom condo was perfect for the four of us. There were only a couple of hiccups with service: (1) Safe was locked and master key was not available. (2)The requested mid-week cleaning did not happen, but we were refunded the fee immediately. Requests for assistance were handled promptly and to our satisfaction. Only negative was the on-site restaurant which we felt was overpriced and lacking in menu choices. A poolside food and beverage bar with poolside wait staff would be an improvement. 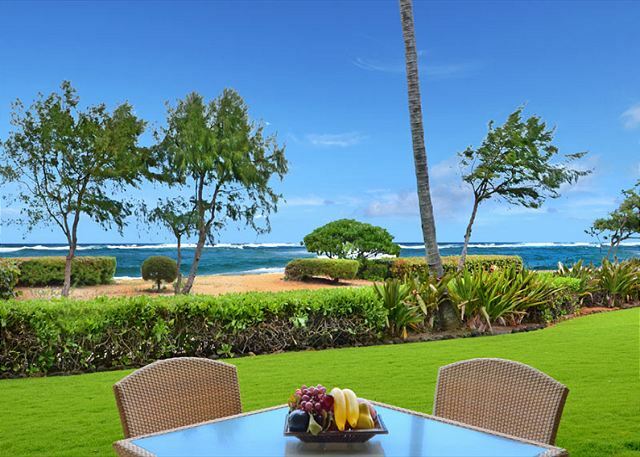 We loved our location on the property and one of our most enjoyable experiences was just sitting on our lanai looking at and listening to the sea while enjoying each other's company. This rental was amazing!! Clean, spacious and right on the beach. We thoroughly enjoyed our stay at this unit . Nicely furnished and updated, very comfortable and can't get any closer to the beach and to the swimming pool. Grocery stores and restaurants are all nearby making this a most convenient location. The only downsides were the low water pressure in the master shower and the heavy traffic outside the complex, other than that, it was a perfect place for us! 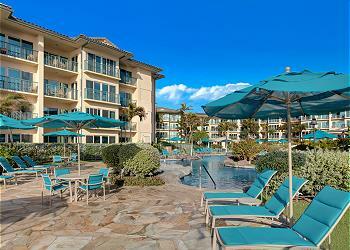 We had a wonderful time at condo A 106 in Waipouli Beach Resort. been better. It was great to hear the waves at night. Our vacation was spectacular with one exception.........our next-door neighbors played extremely loud music and TV which vibrated through our walls. This made it very difficult to sleep. Security responded promptly to our complaints, but our neighbors continued playing the loud music for several nights. Noise Resolved! We do manage A107 next door & once we were made aware of this we simply moved a small speaker box that was touching the wall and vibrating the metal in the wall. We were also made aware that a small person residing in that living room was sneaking TV late at night and moving the speakers around. We should have gotten a call from Waipouli Security to resolve this as it was taking place as we are here 24/7 @ 1-877-Go-Kauai! In fact, Security would not have been the best # to call. MAHALO KEM Management Call 877-Go-Kauai any time! This was by far the most amazing room we've ever stayed in. Beautiful kitchen, 3 clean bathrooms and the view out the door was beautiful. We slept with the sound of the raring ocean right outside every night. Great location, great view, beautiful property setting. We would love to return again soon. We really enoyed our stay at condo A106. We had one issue, which was resolved very quickly by the management company. Thanks for letting us use the condo! A stay in Paradise !! We absolutely loved our stay at this condo. Our patio was facing the beach and only a few steps away from the water. Being on the ground floor with a grassed area was perfect for our little grandaughter who had just learned to walk. We were also a very short walk to the pool as well as the restaurant. The mai tai's there were the best!! The condo itself was nicely furnished and the kitchen had everything. Unfortunately, we were unable to swim in the ocean but we just hopped in the car and went to a beach or used the pool. The pool area is very nice for kids and adults as well. The area there is very central, so we were able to drive north or south without taking hours. We really enjoyed the property and would definitely like to return. 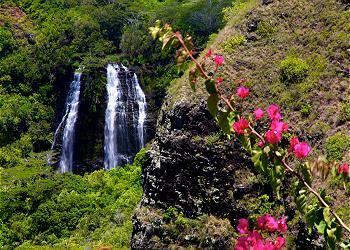 Kauai is a wonderful island, which we very much enjoyed. Our unit was very clean and the kitchen well-stocked for cooking. We like to make most of our own meals while on holiday, so it was nice to have a unit which actually had a kitchen that enabled us to do so! Great location - easy access to all of the shores. The condo was awesome, would come back again!! The Condo (A106) was fabulous with the best ocean view/access. The pool was wonderful and daughter loved it (met alot of new friends). a 106 location is immaculate on view of the of the mighty pacific. view of the sunrise on the east was an experience. We had a wonderful time and we'll definitely be back!!!! Great location - great condo! Overall, I can't imagine anyone not being thrilled with A106. We stayed 8 nights in May with our infant and 4 yr old and this first floor location was perfect. Lot's of grass to run around on yet easy to make sure she didn't stray too close to the beach. A 10 second walk to the pool, yet we never heard any pool noise from around the corner. 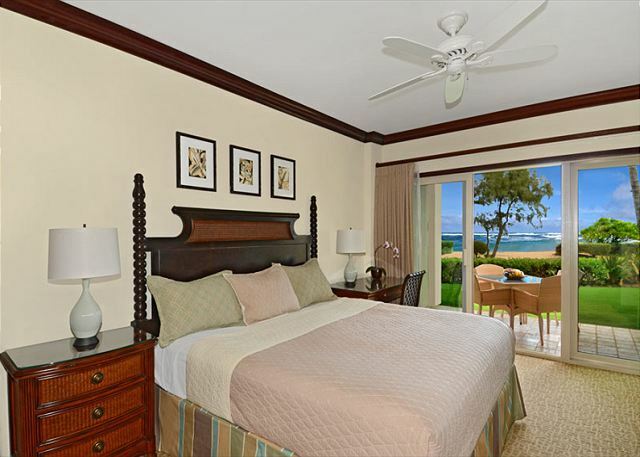 I cannot imagine a Hawaiian vacation without going to sleep and waking up with the sound of waves crashing outside our door, which is what you will enjoy in A106. Coffee on the lanai in the morning as we watched the sunrise became a welcomed habit. A106 was spotless. Most everything worked great. The on site staff was friendly and helpful. My only complaint: The ad we referenced for A106 ( as of this writing, the ad has not been corrected... ) stated it had two king beds which was important to to us. Reality is it has 1 standard king and 1 standard queen. There is a hide-a-bed in the couch if needed. Also, be sure to bring your own bath soap and shampoo as they are not provided for you. Also, the ice maker in the freezer did not work. But, other than that, we were very satisfied with A106. Nothing is ever perfect, but we all seek that perfection on our vacations. I believe A106 is as close as you'll get in Kauai. 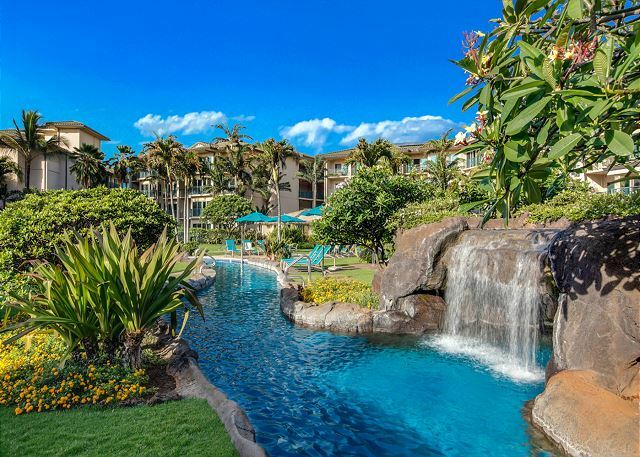 Once we landed in Kauai and looked around, I doubt you'll find anything that compares on the island, especially if you have kids (the pool is great), and especially for the price. OH... did I mention the convenience of the Safeway and Starbucks right across the street? Great unit that is truly steps to the beach. Fantastic view, great lawn out the back patio, and peaceful rest with the sound of the ocean at night. Fantastic. A beautiful and well-maintained unit. Our family was extremely comfortable. The ocean views & sounds coupled with the close promixity to pool/beach were a dream come true. The kids loved watching the birds and playing in the grass. We loved drinking our morning coffee on the lanai and watching the sun rise while listening to the waves. One item we felt the unit was missing was a toaster. One note on the resort....the pool did not seem to be heated, as it was quite cold. Our kids still had a great time playing on the awesome waterslides and warming up in the hot tubs. However, the temp of the pool was our only let down. We are already looking forward to returning to A106 at the Waipouli. fantastic condo! we would definitely come back to A106 again soon. joshua was very nice and helpful. A wonderful condo and perfect location!!! Thanks so much. We can't wait to come back again. Great location - close to shoping as well as activities on the north and south side of the island. Management for private rentals was not on site, and Waipoli Resort staff couldn't help us since they didn't own the property. Amy in Concierge was GREAT. She recommended the perfect luau - at Kaola plantation and deep sea fishing with Jeff (you get to keep fish). The BBQ and pool area was wonderful, although the slides were frequently closed. We were disappointed that we couldn't sit in the hot tub with our teenage girls because they weren't 18. The guests were friendly, Johnny Depp was there too. 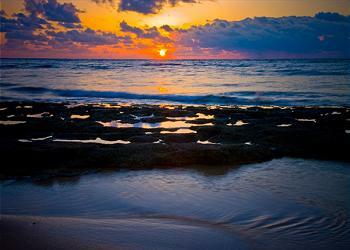 The sunrise was spectacular and falling to sleep with the ocean sounds were incredible. If it is a full moon, take your camera to bed for wonderful pictures in the middle of the night. A106 is IDEAL for a family with children. 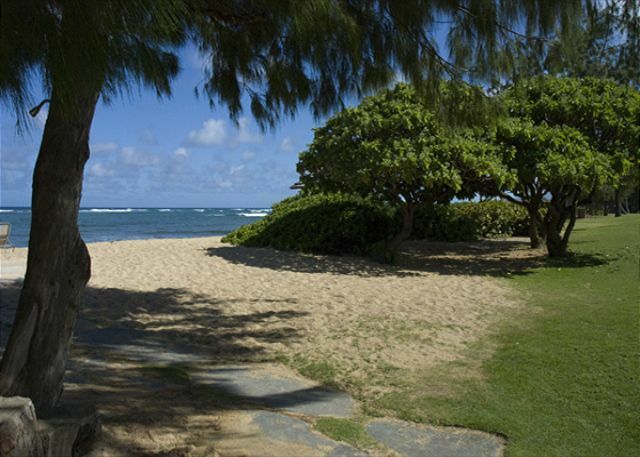 It opens to a small grassy area with a low hedge and the beach just beyond that. 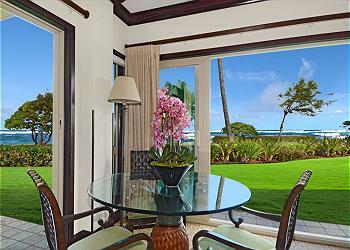 The kids can run around and play while you relax on the lanai, taking in the gorgeous view. From the lanai, you can welcome the day with spectacular views of the sunrise while sipping your morning coffee(if you are up that early, depending on your time zone). It is very close to the pool and restaurant but just far enough away so you don't have to hear the noise from your unit. 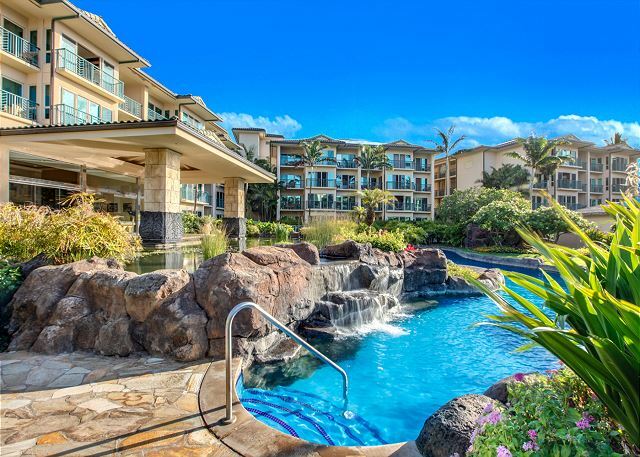 Very convenient to get the kids back and forth from the awesome pool with two waterslides, a lazy river and four waterfalls.The condo is well furnished with all the necessites.Finally, the resort is conveniently located in the middle of the most popular spots on the island, Poipu and Princeville, making it fun and easy to have outings and explore the island.